Variations: 2'8"x3'10" 3'10"x5'4" 5'4"x7'8" 7'8"x10'9"
Be the Georgia College Team Spirit biggest fan and be a key player in kicking off the season right. 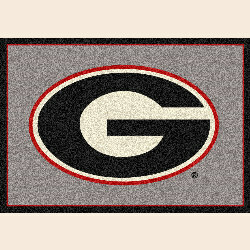 Support your favorite team with a Home Field Rug! Made of 100% Nylon Pile Fiber.